Gusts of fierce wind sway palm trees. Photo via Pixabay. 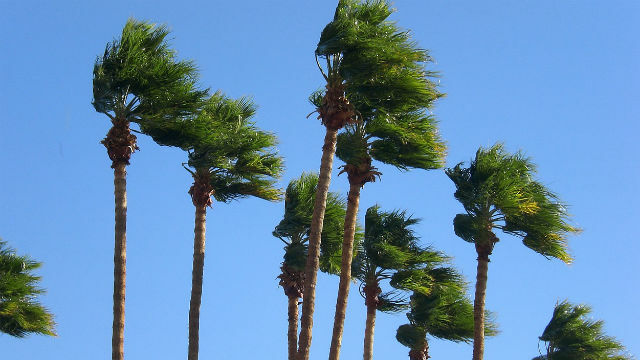 A strong wind advisory issued by the California Highway Patrol is in effect Tuesday from Tavern Road in rural Alpine eastbound on Interstate 8 to the Imperial County Line. The CHP reported wind gusts up to 43 miles per hour in Alpine, 54 mph in Otay Ranch and 66 mph in Hell Hole Canyon in Valley Center. Gusty winds were also reported along Crestwood Road in Live Oak Springs paralleling I-8 out to the Imperial County Line. Patchy, dense fog and rain were also reported along eastbound Interstate 8 and State Route 79, Japatul Valley Road, in eastern San Diego County, according to the CHP.